Use this exercise with your students to pick out facts that would support a paragraph about a specific topic. Use this resource to assess your students’ skills when it comes to responding to narrative prompts. Flex argument writing skills by writing about products with this worksheet. 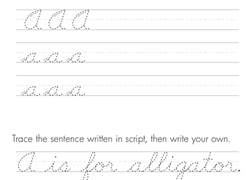 Kids practise writing capital and lowercase "A" in cursive on this year four writing worksheet by tracing the letters, then writing their own. 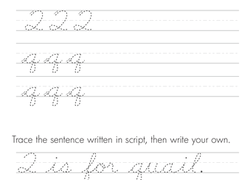 Kids practise writing capital and lowercase "Q" in cursive on this year four writing worksheet by tracing the letters, then writing their own. 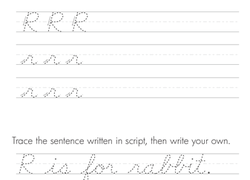 Kids practise writing capital and lowercase "R" in cursive on this year four writing worksheet by tracing the letters, then writing their own. 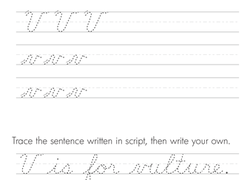 Kids practise writing capital and lowercase "U" in cursive on this year four writing worksheet by tracing the letters, then writing their own. 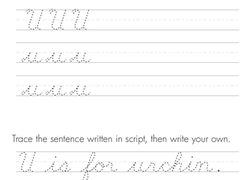 Kids practise writing capital and lowercase "V" in cursive on this year four writing worksheet by tracing the letters, then writing their own. 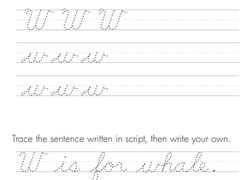 Kids practise writing capital and lowercase "W" in cursive on this year four writing worksheet by tracing the letters, then writing their own.